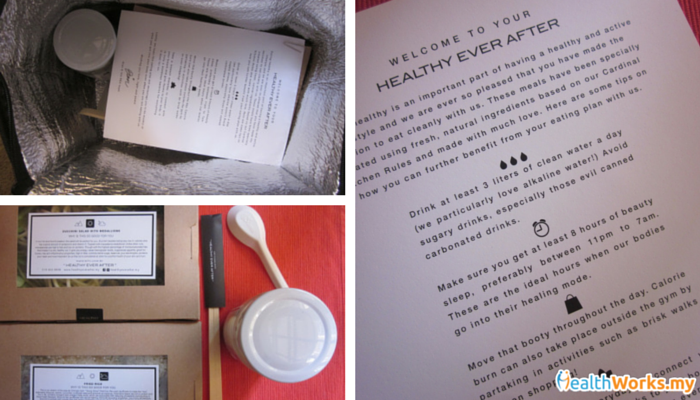 Contrary to the usual lunch deliveries we’ve reviewed earlier, Healthy Ever After provides you not just with lunch, but with a complete daily meal plan. This means you get your healthy breakfast, lunch and dinner! 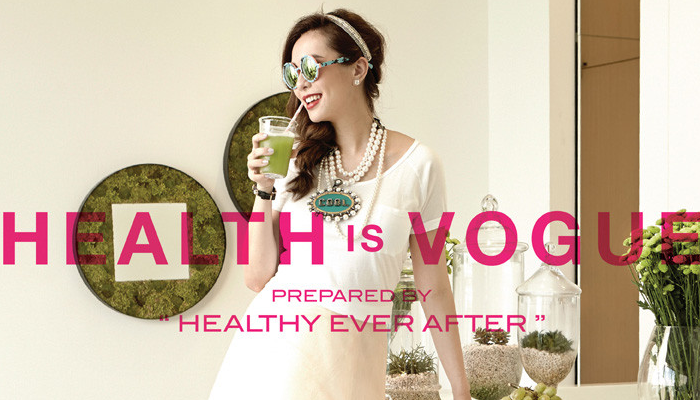 This eat clean company, driven by their tagline “Health is Vogue”, advocates a balanced life and a balanced diet. Knowing that food makes up a large part of life for us Malaysians, Healthy Ever After isn’t here to make you give it all up. Instead, they aim to provide your body the means to spring clean its system in a natural way – by eating healthy super foods. In short, Healthy Ever After claims to prepare eating plans to help your body detox, heal, lose weight and feel amazing. Though we’re not too sure about the detox part, we agree that eating clean is definitely a better choice! The sweet ladies at HEA were kind to let us try a 3-day meal plan. It’s great to know that HEA have put in a lot of effort researching for their food preparation. Their cardinal kitchen rules include not using food preservatives and coloring, and going for sugar-free, natural and organic whole foods, good fats and more. So let’s dive in to my 3-day meal plan! I must say, I was very impressed with the whole presentation of the delivery. They delivered 3 meals in a heat preservation bag and you get to keep the last one. They also educate you on what’s getting into your body! 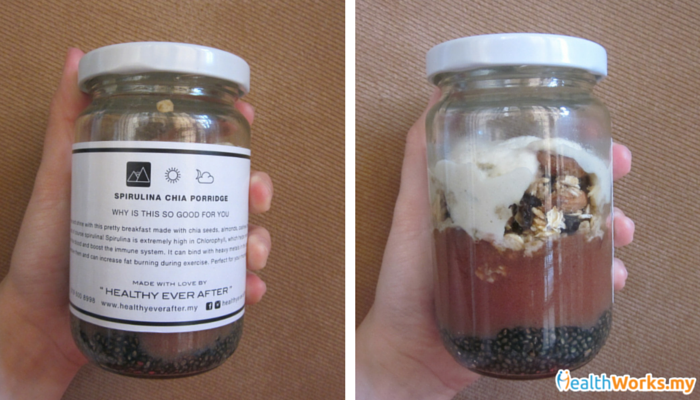 What’s in it: Chia seeds, almonds, cashew, strawberries and spirulina. Taste: It’s a very chewy meal. The strawberries added a natural sweetness to it. I felt like I was loading up on my fibre intake. Verdict: Great taste, good blend of textures. Spirulina is extremely high in chlorophyll, which helps remove toxins from the blood, while boosting your immune system. If you don’t like drinking spirulina, perhaps this meal is a great way to start the day! 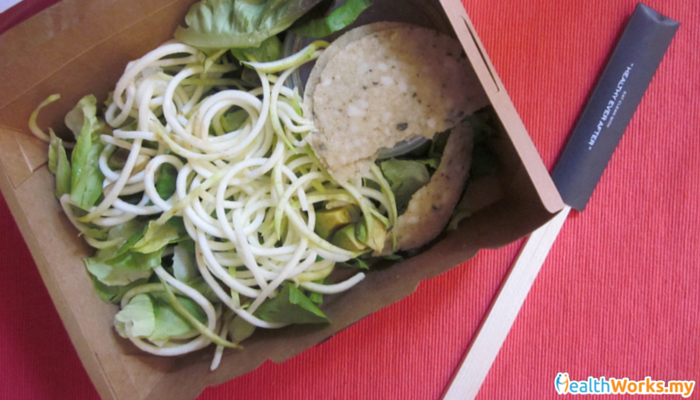 What’s in it: Spiralized zucchini topped with macadamia medallions. Taste: Super refreshing meal in this hot and humid weather. The dressing had a sweet cherry taste to it. Verdict: I will recommend this to anyone to try. It’s low in calories yet high in minerals like potassium and vitamins like vitamin C thanks to the zucchini! Bonus points for using healthy nuts like macadamia which has a high amount of monounsaturated fats that are good for your body. Not just that, it’s also high in fiber which most of us Malaysians lack. What’s in it: Don’t be deceived by the title. This is an adaptation of the “Yeong Chow” fried rice. Cauliflower was used to make the “rice”. Mixed with edamame, broccoli, carrots, cucumber, sunflower seed and almonds as toppings. Taste: Since it was eaten raw, it was a little bitter from the cauliflower. It tasted a little better after I mixed it with some of the sauce provided. Verdict: There was too much caulirice. For a person who isn’t used to eating clean and raw, it was a little challenging for my taste buds. I wished there were a better balance of different veggies in the dish instead of the overload of cauliflower. No doubt, it was a healthy meal. The edamame is rich in protein, low in fat and contains omega-6 and omega-3 fatty acids. These are all associated with reducing cholesterol and will be helpful for the heart. Broccoli is well known for its cancer fighting properties and is packed with soluble fiber. Carrots, cucumbers and almonds are also great for its minerals and vitamins. That’s why I wished they gave more of those. 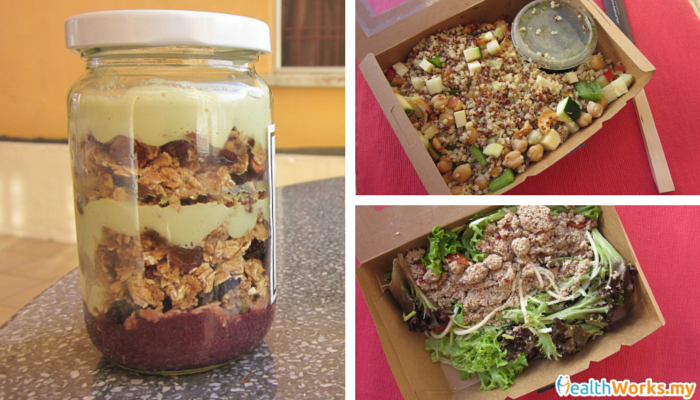 What’s in it: Homemade granola, sunflower seeds and avocado cream. Taste: All hail avocado! I think mixing granola with avocado cream is always a brilliant idea! So cooling, refreshing and yummy. You’ll keep wanting to grab for the next mouthful. Verdict: Love it. Love it. Love it. Their homemade granola was chewy, nutty and sweet. I personally think the avocado cream got me hooked at first bite! Great meal that contains loads of dietary fiber which is good for your gut. You’ll be feeling really full after this one meal. 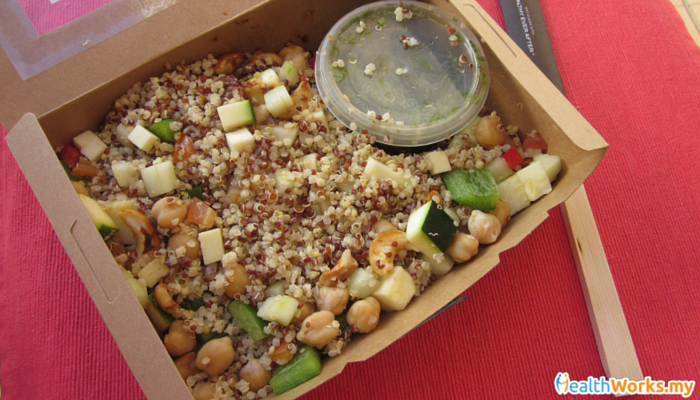 What’s in it: Chickpeas, quinoa, celery, cashew nuts, capsicum, tomatoes, served with lemon dressing. 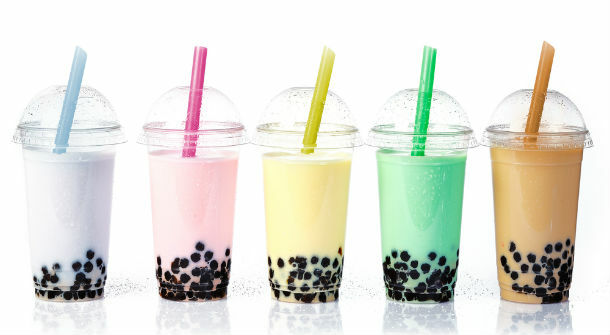 Taste: Tasted good and refreshing! Loving the mixture of textures in a mouthful. You’ve got the soft chickpeas, the quinoa, and the crunchy cashew nut. Mix them with the lemon dressing, and you’ll get one healthy tasty meal! Grab some tomato bites and you get more juiciness out of the meal. Who says clean eating has to taste bland? Or was it the lemon that did all the magic? Anyhow, thumbs up for taste! Verdict: A meal to recommend to those who love rice! 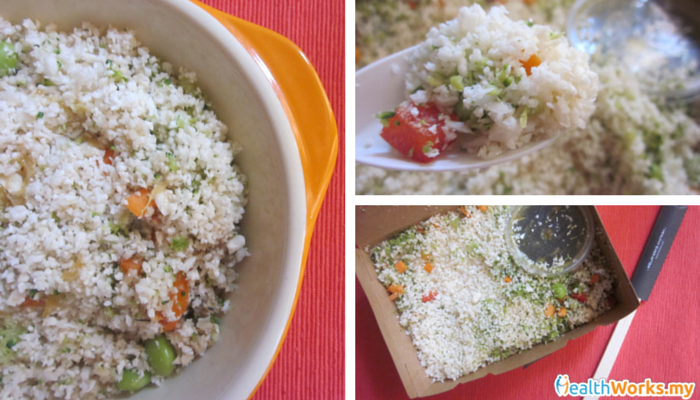 Quinoa is a good alternative to rice. Selection of chickpeas was wise as they are not just high in fiber, low in fat, but also rich in vitamins and minerals. A good dose of chickpeas helps with your gut health and blood sugar level. Definitely a power lunch that will leave you alert and ready to charge on for the next half of the day. Taste: Tasted nutty although the meal was a little dry. At first glance, it did look like tuna until I tasted it. 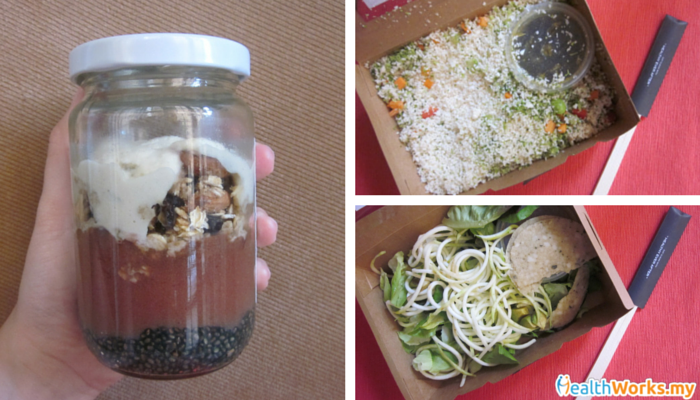 It’s a raw “tuna” salad that’s actually made out of all the healthy nuts and seeds. To be honest, I thought it went a little weird with the veggies. Verdict: Personally, I was not a fan of this meal. But I definitely liked the idea of mixing all those nuts and seeds to looked like tuna crumbs. Grab this if you want a boost of antioxidants. What’s in it: Coconut milk, chia seeds, vanilla, kiwi and bananas. Taste: This “porridge” was my saviour. I needed to rush out so this combo enabled me to gobble up my meal within 10 minutes and still feel nourished and awake. The chia seeds, soaked in a magical concoction of coconut milk and vanilla, came out gooey like jelly — which made it perfect for anyone who needed a quick meal! Kiwi chunks and sliced banana added their own unique flavours to my breakfast. Verdict: I think out of all 9 meals this came top of my list. Apart from its great taste, it is packed with good fats, fiber and antioxidants. Most importantly, it made me feel really full. Just remember to drink more water when you take in more chia seeds as you might experience constipation. What’s in it: Almond, cashew nuts, carrots and cabbage. Nope, there’s no meat although it’s called “pate”. 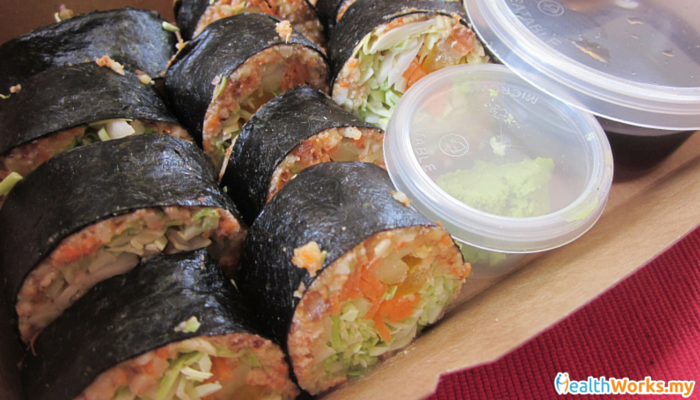 Taste: Why didn’t Japanese sushi restaurants serve this? Every sushi I popped into my mouth tasted amazing. I can keep eating knowing that I’m not consuming Japanese rice, which is definitely less healthy and a lot less nutritious than this. Surprisingly, this meal wasn’t as dry as I thought it would be. I believe the veggies helped give some moisture to every bite. Bits of raisins added sweetness to these rolls! Verdict: They say food that tastes good should not be good for you. This meal proved it wrong. It was yummy and healthy. Cashew nuts are known to be good for your heart, hair, skin and bone health. They give you the good fats that you need for your body. What’s in it: Tomatoes and nuts wrapped in baby cabbage leaves. Taste: Crunchy and light. It’s a very simple raw meal, which is good for dinner as we don’t have to eat too much for dinner. 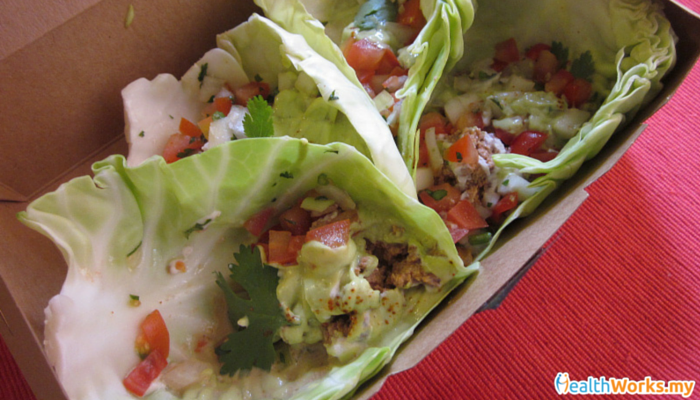 Verdict: Points given for their innovative idea to use baby cabbage leaves as tacos. But of course, it’ll taste totally different from tacos. Was pretty messy to eat them by hand but otherwise, it makes a light healthy meal. Ordering process is simple. And you get to choose your delivery time. Different plans available ranging from 1 day, 3 days to 5 days. There’s also the 1 day hangover plan. Delivers on time, sometimes early. Healthy, clean, raw food for anyone who wants to cut off from nasty diets for a short period of time. 3 meals included so you don’t have to think about what to eat for your next meal the entire day. Great service. One of my meals didn’t look quite right and they immediately sent a replacement over within an hour. High price tag. I believe this is mostly due to using organic products and natural high quality ingredients that are relatively more expensive. Eating clean to the max. It will pose a taste bud change for those who are not used to this, especially if you have an affinity for sweet and savoury. I needed time to get used to the raw caulirice. So you might want to try the 1 day plan first before you dive into a 5 days plan. Currently only available at Bangsar, Damansara Heights, KLCC, Mont Kiara area. If you are allergic to nuts it will be a little tricky. Do remember to check if they can accommodate to your requests. It’s a 3-meals-a-day programme. So you will not have the freedom to eat something else for any other meals. But hey, you’re on a healthy eating programme aren’t you? Might as well commit to all meals. It was a good clean eating journey for 3 days. But that can be a double-edged sword, I believe. On one end, it’s a great way for anyone to kickstart his healthy eating journey as a lifestyle itself. On the other, if it doesn’t suit one’s taste, that person might give up and think healthy eating is tough. 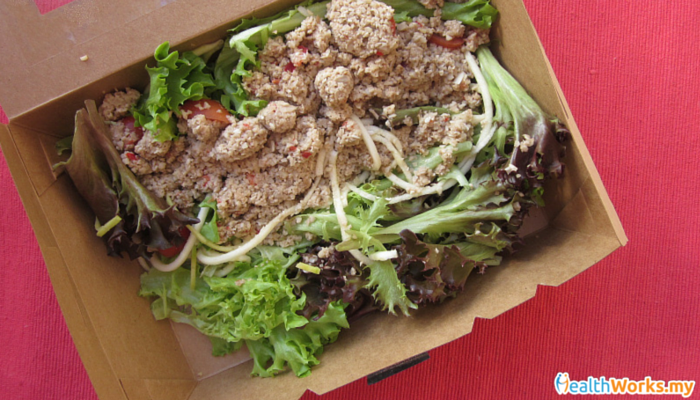 Not all of us will be able to adopt the raw diet lifestyle due to various reasons. Yet, there is always hope. As long as we focus on a wholesome and balanced meal, accompanied by an active lifestyle – we don’t have to go raw. Disclaimer: All meals were sponsored by Healthy Ever After. 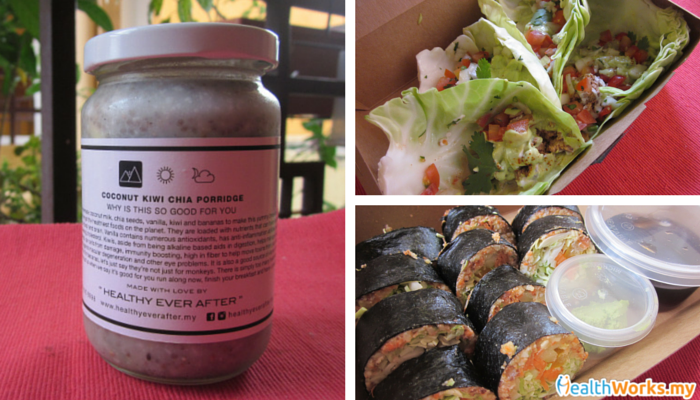 Have a healthy food delivery service you’d like us to review? Let us know in the comments below or on our Facebook page!